Mann Engineering ltd recently attended the 4th Annual WIT Lean Forum in Waterford Institute of Technology (WIT), which brings together employees from both multi-national and indigenous SME’s from all over the country, to understand and discuss new developments in lean manufacturing. Guest keynote speaker for the morning conference was Lean guru, Professor Peter Hines. A Visiting Professor at WIT Business School, Professor Hines is known the world over as a Lean thought leader, an academic and a practitioner, consultant, award-winning author who is also a Senior Certified Shingo Facilitator. Members of our team attended this event, including our Engineering Manager and Lean Master’s Graduate Michael Dwyer, who graduated from WIT earlier this year. Also present were a number of our customers, As a company we find it beneficial, both to our customers and ourselves to develop relationships at all levels of our organisations. By understanding our customers needs we can meet their specific requirements more readily. 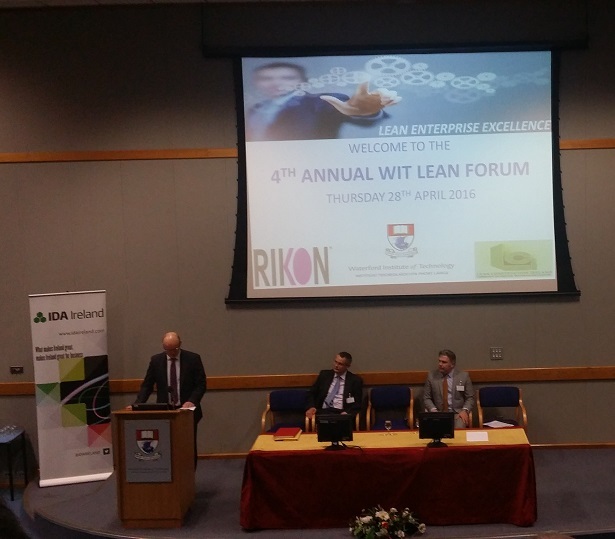 The WIT Lean Forum is on it’s 4th year and has grown to become a hugely popular event in Waterford and is now the leading Lean Enterprise & Operational Excellence event in Ireland. The free full day conference showcased cutting edge developments in the lean manufacturing industry, including management, thinking and putting it into practice. It was a fantastic networking experience for business and organisations that wish to develop their lean thinking and practice to grow their competitive edge in the global marketplace. The event comprised of a range of 12 sessions, delivered by experienced practitioners and subject matter experts on key elements of lean enterprise, operational, and process excellence, as well as service improvement and continuous improvement. This was a truly memorable event and we are already looking forward to attending again next year.